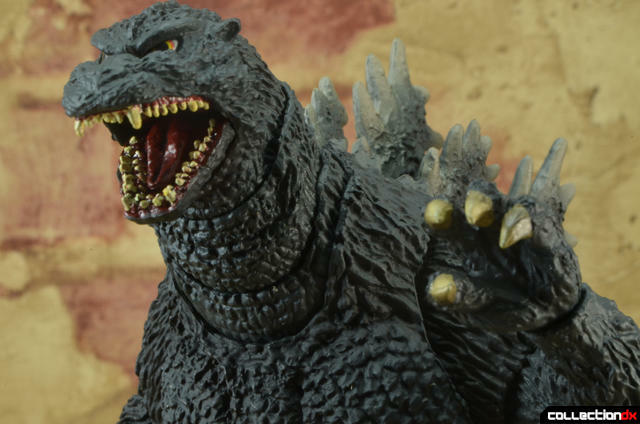 Godzilla stomps through CDX thanks to Bluefin Distribution. Get your S.H. 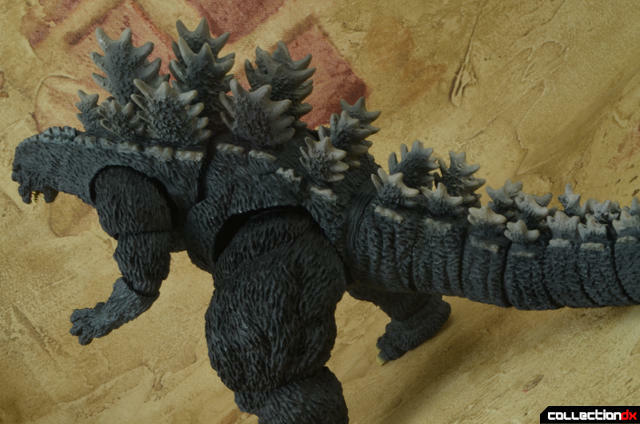 MonsterArts Godzilla at TheToySource. Godzilla VS. Destroyah is in my opinion one of the best Godzilla movies to date. It is a fitting finale for the 90’s Godzilla series. This film featured the titular monster, Godzilla, in a bit of a predicament. In the film, the big G-man is suffering from a case out-of-control radioactivity, making the monster a ticking, nuclear time-bomb. If facing an imminent Godzilla meltdown wasn’t enough of a problem, Japan also had to deal with Destroyah, the monster born from the Oxygen Destroyer of Dr. Serizawa. Godzilla VS. Destroyah, much like the original Godzilla film from the 50’s, has a very anti-nuclear theme to the story. At the end of the Godzilla VS. Destroyah, Godzilla ends up releasing all of its stored up nuclear energy, which almost turns Tokyo into a ghost town. However, the day is saved by Godzilla Junior’s ability to soak up his adopted father’s radioactive energy. In doing so, Godzilla Junior evolves into a fully grown adult Godzillasaurus. With the introduction of the new Godzilla, the film shows that the Godzilla legacy will live on no matter what. Ironically, Godzilla Junior’s fully grown form is only seen in these last moments of Godzilla vs Destroyah. The next “Godzilla” movie that was made was the 1998 American production that most of us would like to forget ever existed. After that, 1999’s Godzilla 2000 kicked off a new film continuity, thus negating Godzilla Junior’s chance to star in a Godzilla film. 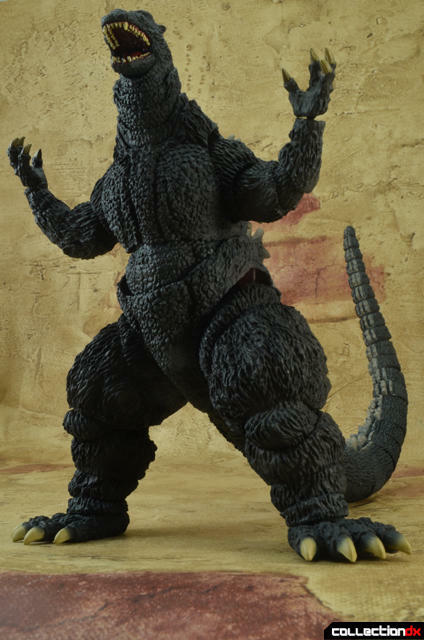 So while Toho never gave Godzilla Junior a chance to shine on the silver screen, Bandai, on the other hand, decided pay tribute to the monster that saved Tokyo from Godzilla’s inevitable meltdown by producing him in the S.H. MonsterArts line. 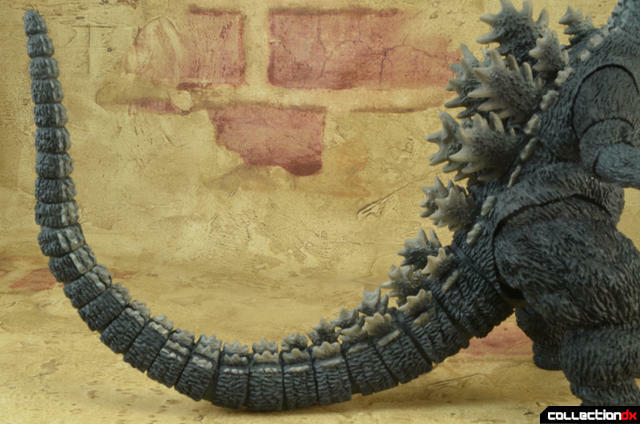 This is another gorgeous looking Godzilla MonsterArts figure that has an awesome sculpt and great paint apps. 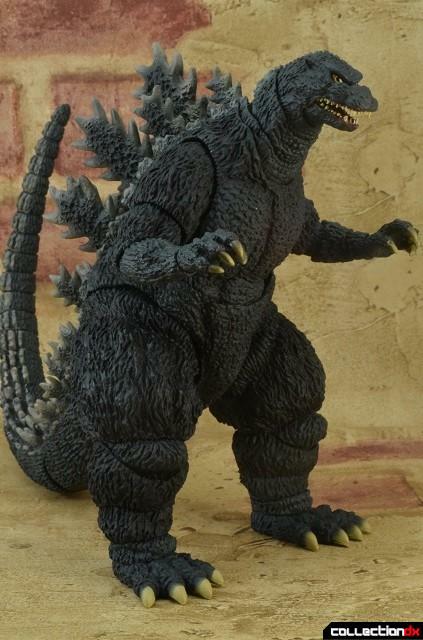 At first glance, I thought this release’s sculpt was based of the 1994 Godzilla figure. There certainly are some similarities. 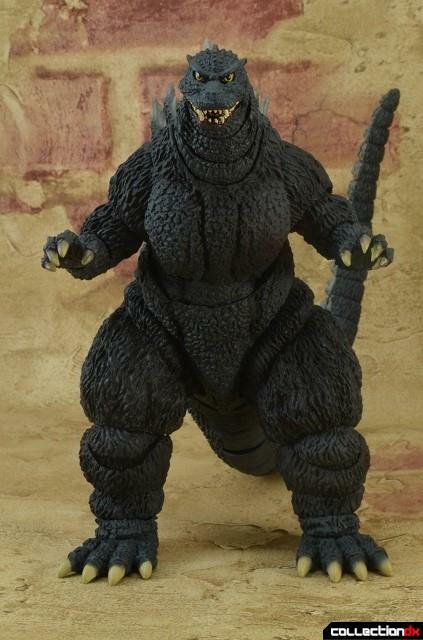 However, the 1994 Godzilla had a few minor issues: limited movement in the thighs, neck and abdomen, and somewhat derpy face. These issues were fixed for the Burning Godzilla release. 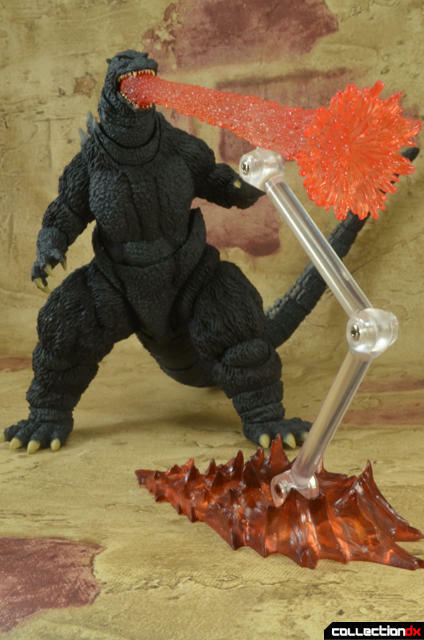 The Burning Godzilla sculpt appears to be the same one that Bandai uses for the 1995 Godzilla release. It makes a lot of sense considering that in the movie Godzilla VS. Destroyah, Toho used the Burning Godzilla suit with the lights for the glowing effect turned off, to represent the adult Godzilla Junior. 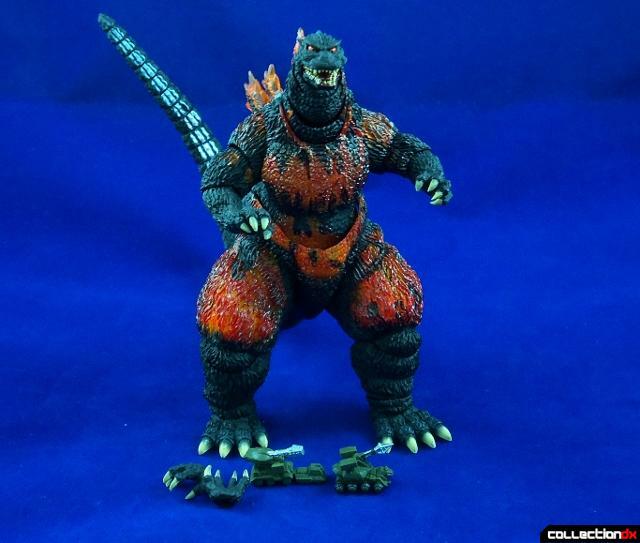 The big difference between the 1995 Godzilla figure and the Burning Godzilla figure is obviously the paint apps. Burning Godzilla’s eyes and body featured glowing orange color and yellow paint to represent the radioactive nature of Burning Godzilla’s state during the movie. 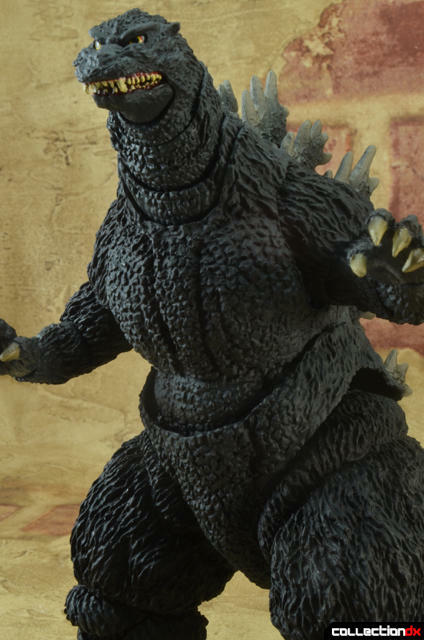 The result of using the Burning Godzilla sculpt, is that you have a much fiercer looking and more screen accurate Godzilla figure. 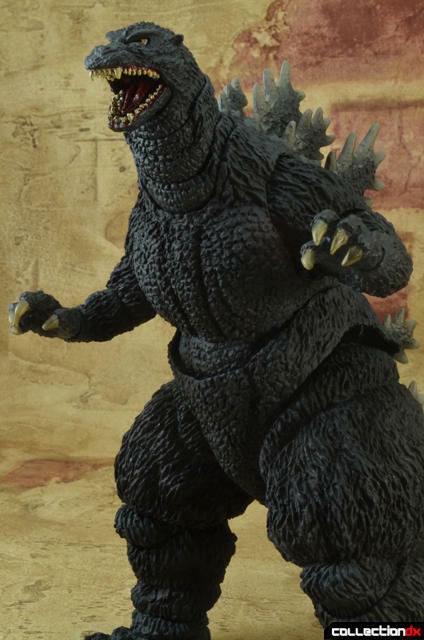 The head and neck feature the improved articulation and sculpt of the Burning Godzilla figure. The abdomen has an ab crunch that appears to be comprised of several ball joints. The arms feature several ball joints. The legs also feature several ball joints, including one at the top of the thigh. While the thighs have a good amount of movement range, the cuts in the sculpt a the thigh leave big gaps between the thigh and crotch area. Gaps in the thigh region aside, the articulation for the legs is awesome. 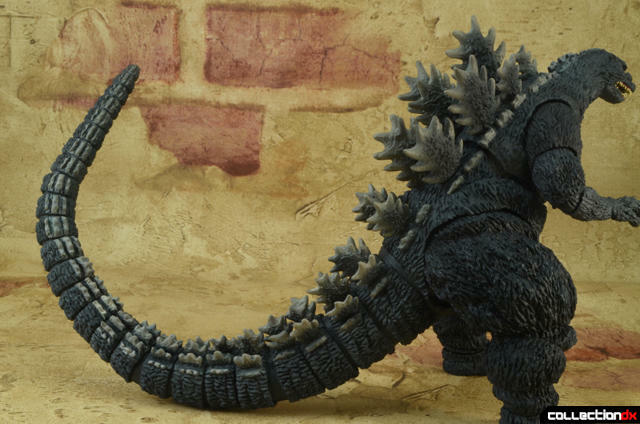 Godzilla can even kneel. 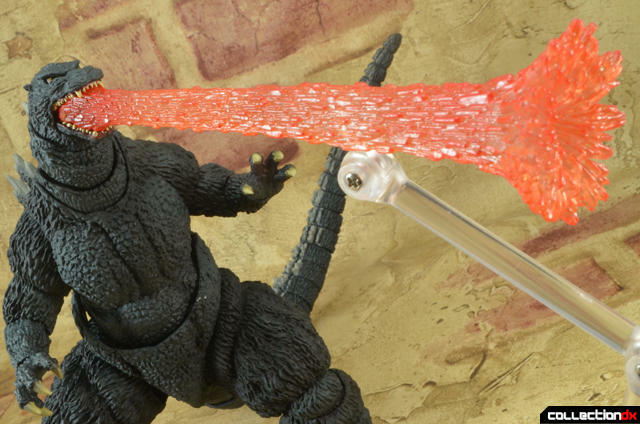 The mouth opens and closes, for all your Godzilla roaring needs. 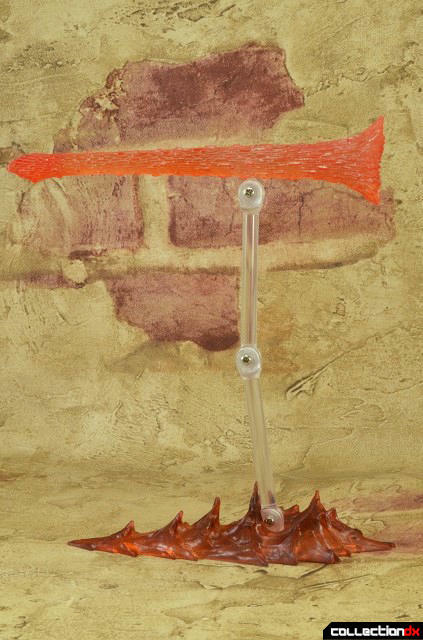 The tail features over 30 ball joints that give the tail a fair amount of flexibility. 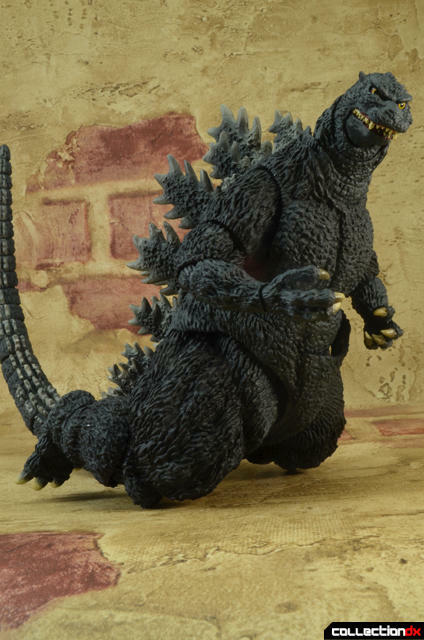 Godzilla's tail joints feel very nice and tight, which is good in a way. 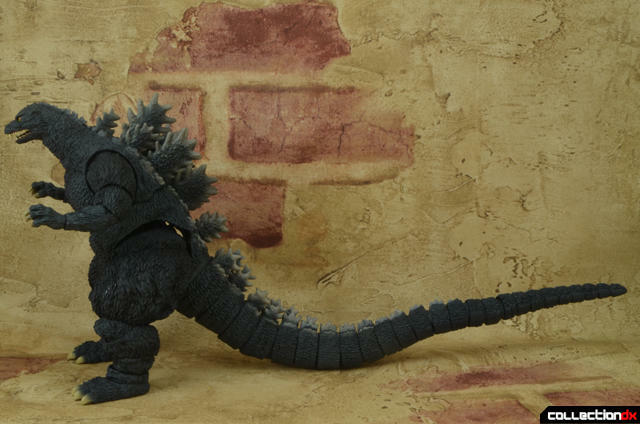 However, this also makes Godzilla's tail not as flexible as the Gigan or the Kiryu S.H. MonsterArts. Nevertheless, you still have a very nicely articulated figure that you can have fun with. 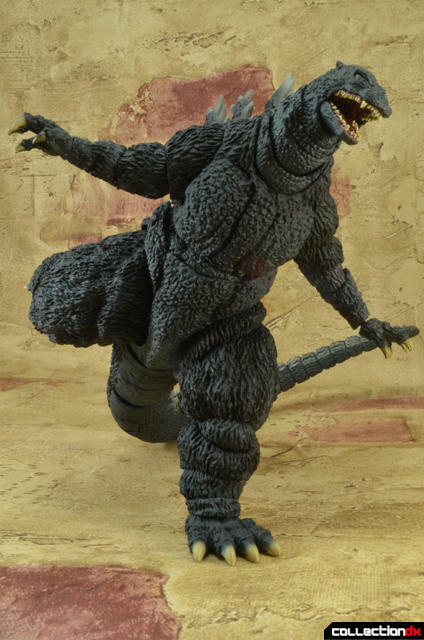 You can even pose Godzilla in a swimming pose. 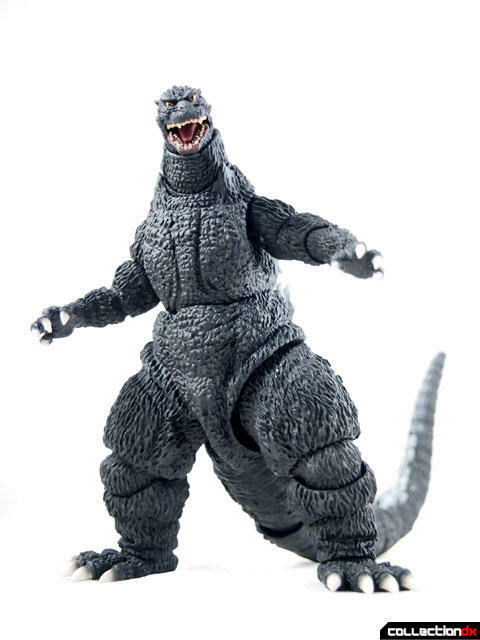 This figure comes with two extras: a spare set of hands with the fingers spread out more, and an effect part for Godzilla’s atomic breath, which never makes an appearance in short time this Godzilla has on screen. It's a bit odd that they would include an effect part for an attack that the character never performed in the movie. But it does make a nice addition to this toy. As for the extra hands, they do allow this figure to be more expressive. However, the way they were cut on mine made them sit funny on the wrist pegs. So I didn’t use the extra hands a whole bunch. But those are very minor shortcomings. All in all, this is a solid release in the line. 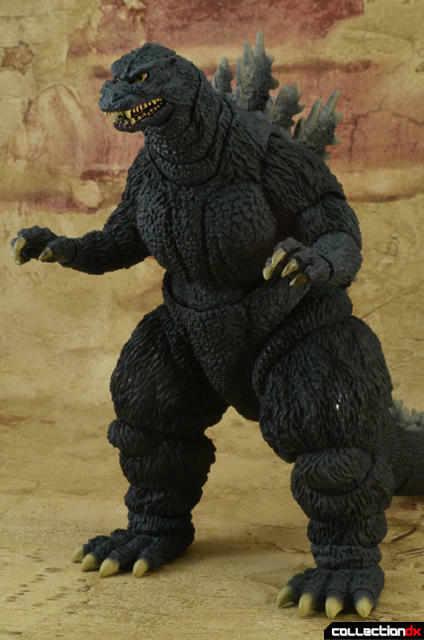 I think it is awesome that Bandai has given fans the full evolution of this Godzilla that was an important part of the 90’s Godzilla movies. 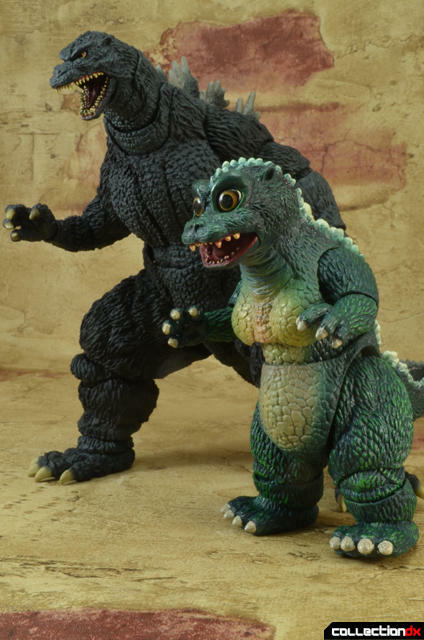 I just need to pick up the Godzilla Junior S.H. MonsterArts to compete the evolution set. 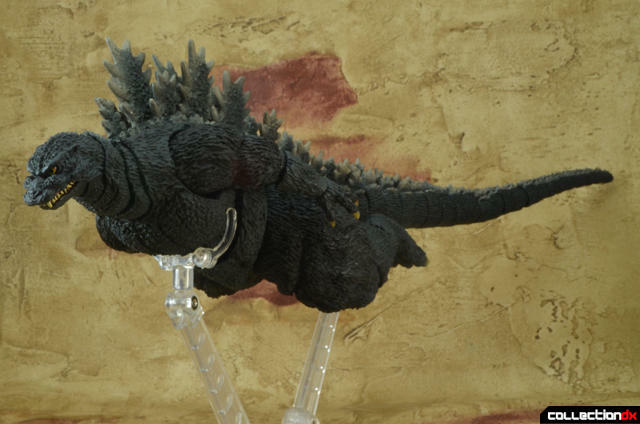 It is also great for the fans looking to add a 90's Godzilla to their collection so that it may rule all of their monsters. After the Heisei films comes "History of the Goji PART 2!" What a spectacle that would be!